Get a great pay monthly deal on the Three Network, all the latest handsets at low prices. Need an awesome new phone and a great mobile phone contract that includes fast 4G data speeds? Then take a look at the TigerMobiles.com selection of contracts and phones from Three. With plenty of contract choices, including design your own phone plans, Three is one of the most flexible networks on the UK market. They've got something for everyone, so get started shopping by checking out our easy to use comparison tool below! 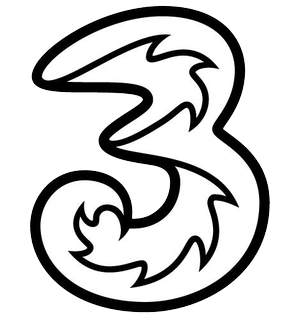 Three launched on a special day in the UK: 03.03.03, the day that 3G service went live across the country. They were the first network to meet the required 80% coverage requirement for a 3G signal, and they're rapidly rolling out a superfast 4G network too! The company originally began doing business in Asia only, then spread to selling on the internet and through independent stores in the UK, and nowadays has their own branded high street shops. Renowned for their flexibility and low data prices, Three is a great operator choice for everyone! With over 30 million customers around the globe, Three is a truly multinational company. And in the UK they offer brilliant 3G coverage. If you're looking for those lightning fast 4G data speeds, then don't worry, Three's got you covered with a rapidly growing 4G infrastructure, and with Three you'll pay no extra for the use of 4G! There are tons of plans to choose from with Three, and it really is one of the most flexible operators around. They do offer Pay As You Go SIM cards, as well as SIM only deals. And when it comes to contracts you can choose between 12, 18, and 24-month contracts with different calling plan limits. Can't find a contract that suits your needs? No problem, with Three you can design your own contract, with exactly the amount of minutes, texts and data you want. You'll get lots of handset choices as well, with Three offering a huge range of different phones. From budget-friendly models to top-end flagship phones, you can get anything you want on a Three incentive contract. And what about perks? Well, Three offers free mobile roaming in 42 countries, letting you use your phone in the same way as you would at home. You can trade in your old phone to help pay for a new one. You get bonuses for recommending friends. Three has awesome customer service, some of the cheapest data rates around, and is the most recommended network in the UK. For truly flexible contracts, including the option to design your own, and loads of phones to choose from, Three is a great network choice. You'll even get those super fast 4G data speeds at no extra cost, as well as superb coverage. Think Three is right for you? Then check out our awesome deals with them by using our simple comparison tool.